Sleeping next to a snorer is like a perpetual hell from which escape can only be achieved by one partner being banished to the couch. 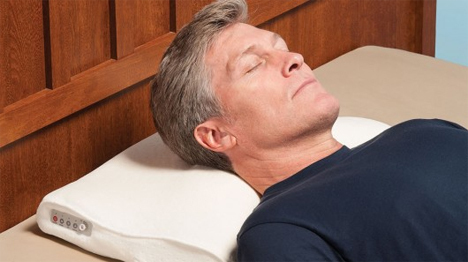 Old tricks like sewing a tennis ball into the back of the snorer’s pajamas (so he can’t lie on his back where he is more likely to snore) don’t always work, but the Snore Activated Nudging Pillow might do the trick. The pillow is a slightly friendlier alternative to nudging or pushing your partner in the middle of the night to stop the snoring. It contains a microphone that picks up the distinctive sonic pattern of snoring. When it does, an internal bladder inflates, prompting the snorer to change sleeping positions. 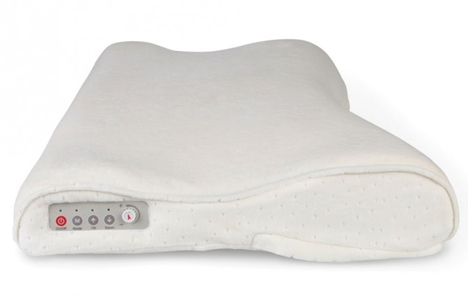 It lifts part of the pillow four to seven inches and then immediately deflates, which should be enough movement to make the snorer roll over without waking them. 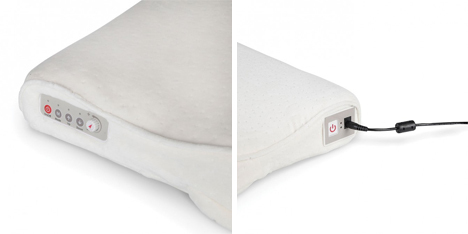 The microphone sensitivity can be adjusted, so if the non-snoring partner is a heavy sleeper the pillow can be set to inflate only at the loudest snores. Although the pillow won’t stop a snorer’s nocturnal noise-making for good, it might at least help make the nights more bearable. The $149.99 price tag is pretty steep, but it’s cheaper than couples counseling and may even reduce the number of nights spent sleeping on the couch. See more in Home & Personal or under Gadgets. February, 2014.